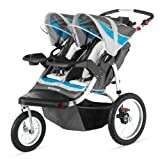 Double Stroller Reviews: How to buy the right one? Double strollers are the way to go if you have twin children or have two with a very short age gap. 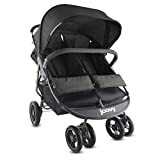 This type of stroller is very efficient because you won’t have to lug around two strollers and at the same time, it allows only one parent to push. It gives the husband or the wife much more freedom, as they won’t have to rely to each other when it comes to taking the kids out. Although double strollers are very bulky, it still saves you more space and effort than buying separate ones. There are also lightweight double strollers that are intended for travelling. 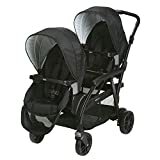 Before you proceed to purchase a double stroller, make sure that it has all the aspects that you need, as well as the design most efficient for you. In this article, we have listed the different types of double strollers and some factors to consider when getting one, so you’ll have no trouble looking for the right double stroller for your kids. What are the different types of double strollers? Mainly, double strollers differ on the style or positioning of the seats but there are also ones that differ based on the usage. We have listed below some types to give you an idea on what’s available in the market. Travel – The best type to get for travelling is a lightweight double stroller that can fold compactly and can be easily lifted to take on the train or on the bus. It should also be sturdy enough to take a beating, especially if intended to be checked into planes. Running – There are so-called jogging strollers that are meant for parents who want to take their kids out for a run. This is great for new mothers who want to get back in shape but can’t leave their babies behind. These strollers are huge, made with big rubber wheels, and are heavy duty. Key Takeaway: Whatever you pick, make sure that it is the best one for your children where they can feel very comfortable and tucked in safe. The stroller is also one of a parent’s best friends as it greatly gives them ease, but if the wrong kind of stroller is picked, it may be more hassle than help. What are the factors to consider when getting a double stroller? Safety – Always put the safety of your child as your top-most priority. Make sure to purchase a double stroller wherein both of your kids will be safe and secured. The double stroller must have proportionate sides so that when your children move a lot, the stroller will be strong enough to hold the weight. Age – Consider the age of your children when picking a double stroller for them. As previously mentioned, side-by-side ones are great for same-aged kids while back-to-back and stadium style are good for a toddler and a baby. You can also get a back-to-back style where a bigger child can comfortably sit behind the main seat. Comfort – The stroller should also be comfortable for them. Get ones that are padded and can be adjusted to reclining position so they can nap whenever they need to. The wheels should also be shock resistant, especially if you’re getting a jogging stroller. This way, your children won’t feel like they’re shaking every time you push the stroller. Convenience Features – Check for other features that your stroller can offer. Does it come with storage pockets or bags? Does it come with organization trays and drink holders? Can you extend the hood of your stroller to cover more? Is the handle bar made of slip-free materials such as rubber? These features can greatly help you. Get the right double stroller based on the style preferred and your needs. Through this guide, you’ll be able to know the different styles and purpose of many strollers and hopefully, you’ll be able to find the right one that fits you and your kids.